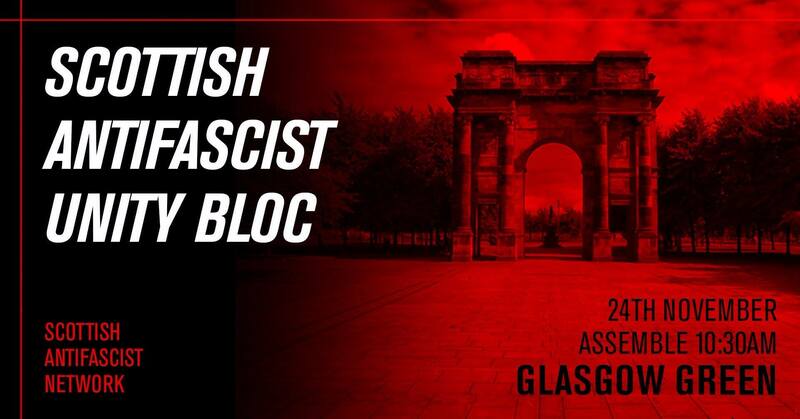 Glasgow St Andrews Day Anti-Racism March: Join the Antifascist Unity Bloc! Antifascists around the globe oppose the rise of the far right; whether in the form of Bolsonaro's rise to power in Brazil off of the back of an institutional coup, to the Afd gaining a foothold in the German parliament, or the slew of far right and neo-nazi street thugs emboldened by Brexit closer to home. In times of crisis, the right is waiting to pounce on their opportunity to channel outrage at a broken system into their ideology of racial supremacy, homophobia, transphobia and bigotry. We can't leave that unopposed. It's vital that the left not only offer better narratives and concrete solutions to these problems, but also counters the right blow for blow when they try to take our streets and our cities and defend our communities from their backlash. As such, antifascists from across Scotland will be converging on Glasgow for the STUC St Andrew's Day Anti-Racism March & Rally to form a coalition Anti-fascist bloc as a united front in support of these struggles, global and local, and our siblings fighting against racism and oppression every day. Come along, bring your flags and your friends to show the world that Glasgow is anti-racist, anti-bigotry and anti-fascist.